Our holistic approach to designing gamification solutions means that we begin, and end, with the most important component: the player. Best-of-breed technologies and leading design principles all combine into a rich product offering. Our extensive feature list stands our solution above the crowd. Allow the experience to be all it can be with a layer of design that represents your business and the participants. Customise the view of missions, levels, achievements and many more. Also enables customisable colour themes to suit users. Understand strengths and weaknesses of individuals, departments and the entire business. Quick pulse surveys or long term engagement surveys. Create engagement by incorporating all activities from all users, presented as a consolidated view. Social likes and follows are easy. Reach out to staff across the program with a well-structured and targeted communication strategy. Communication can be personalised and segmented based on the organisation. Digestible learning units and short-term learning which can be applied with minimal impact on resource management or productivity. Powerful engine, ready to go. Define, track and reward any behaviour that is critical to business success. Can be communicated to employees or customers, and help drive actions. Create short- or long-term goals aligned with organisation’s strategic objectives. Encourage the user to perform the right behaviour multiple times. Run across different behaviours to unlock rewards. Can be completed randomly allowing progress based on user preference. Identify and target specific metrics, groups, individuals, challenges and even themes. Used to create a personalised experience. Our design philosophy begins with a business goal and builds into a cycle of sustained innovation. 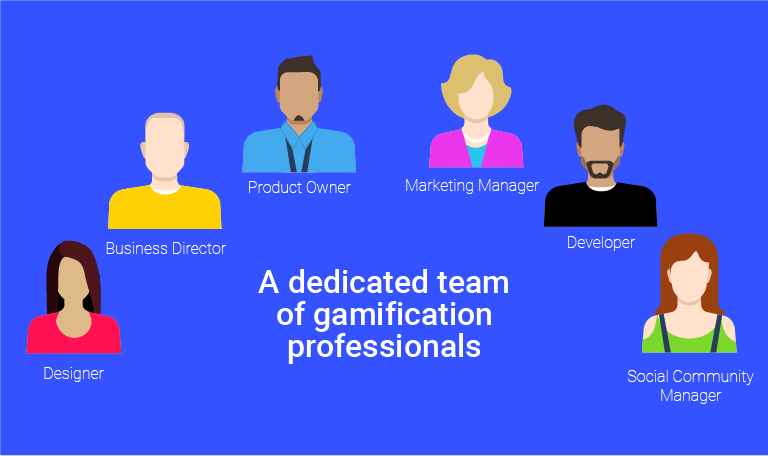 Our solution team focusses on delivering excellence through a particular set of skills tied to a love of gamification.